Fleckney and Kibworth is an active running club catering for runners of both sexes and abilities, from complete beginner's to the more competitive athletes and serious marathon runners. We successfully participate in both road running and cross country leagues in Leicestershire. We train every Tuesday and Thursday from Beauchamp College in the winter time (road routes only) and in and around the Fleckney area during summer alternating between Fleckney, Kibworth and Saddington, with a variety of road and cross country routes available. We often arrange fun Pub Runs throughout the year. Our foundations date from Spring 2006 when a number of people from Fleckney and Kibworth with similar interests started to meet informally and run together. The club was established in January 2007 and was admitted into England Athletics in May 2007. 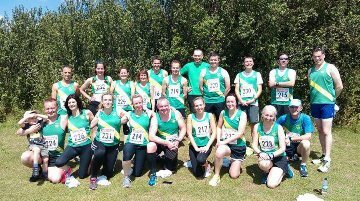 We successfully participate in the Leicestershire Road Running League with both ladies and men's teams competing. We are also registered with the Derby Runner Cross Country League allowing our runners to take things off road! Locally we support races such as the Great Kibworth Run, the Leicestershire Round Relay and the Leicester Marathon/Half Marathon. In the spring and summer we take advantage of the immense choice of routes in this beautiful corner of Leicestershire alternating between Fleckney, Kibworth and Saddington. In the high summer, we host social runs which start and finish at country pubs which are always great fun. The winter period sees us switch our base to Beauchamp College, Oadby where we have access to a meeting warm up room, changing rooms and showers. Club nights are currently on a Tuesday and Thursday evening at 7.15pm, with a meet time of 7.00pm. New members are always welcome to join us at either of our club nights where we cater for runners of all abilities with runs from three miles onwards.